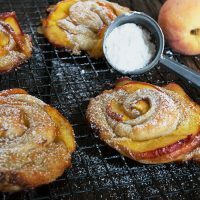 These easy Peach Pastries start with store-bought puff pastry and have a filling of mascarpone (or cream cheese) and peaches. Defrost your puff pastry according to the directions on the box. In a small bowl, stir together the mascarpone, vanilla and honey, if using. Set aside. Unroll puff pastry on a lightly floured cutting board. (The brand I use is 10-inches x 10-inches per roll. Each roll will make 4 pastries). Cut each pastry roll into 4 strips, 2 1/2-inches wide each. Spread a thin layer of mascarpone filling down the centre of each of the strips. Spoon a spoonful of mascarpone at the bottom of each strip. Cut thin slices from your peaches. Lay the slices, overlapping along one side edge of the pastry strips, with the peel side peeking over the side edge slightly. Spoon a little jam over the peaches. For each strip, fold the uncovered half of the strip over the half with the peaches. Starting with the end closest to you, roll up the pastry and pinch end together with the pastry slightly. Place "rose" onto parchment lined baking sheet. Repeat with each pastry, allowing several inches between pastries, as they will spread as they cook. Bake in the preheated oven and bake for about 45 minutes, just until the puff pastry is puffed up and cooked through. Transfer to a cooling rack to cool. Enjoy the day they are baked! For shaping, refer to the step-by-step photos on in the Cook's Notes of the original post!